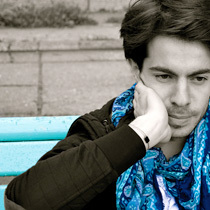 Born on 24th December 1986, Aurèle Marthan began playing the piano at the age of 4. After studying music at the National Music Conservatory in Bayonne, he continued his training under Denis Pascal at the Rueil-Malmaison National Music Conservatory where he obtained first prize for excellence and proficiency. He was unanimously awarded first prize in the Michel Moraguès Chamber Music class. Then he decided to extend widely his chamber music repertoire with Paul Meyer and Eric Le Sage at the Paris National Music Conservatory. Fascinated by a diversity of influences, Aurèle immersed himself in Russian techniques and expression by working alongside Elena Rozanova. He then continued perfecting his art in Italy with Maurizio Baglini and Piero Rattalino at the Istituto Superiore di Studi Musicali “Claudio Monteverdi” di Cremona where he received the special commendation of the jury for his interpretation of Rachmaninoff’s piano concerto n° 2. He then went on to study at the Higher National Conservatory of Music (CNSM) in Paris in the chamber music class held by Philippe Bernold and Emmanuelle Bertrand. Aurèle is currently studying at the Royal Academy of Music of London with Tatiana Sarkissova where he also participates in masterclasses held by Imogen Cooper, Pierre-Laurent Aimard and Pascal Devoyon. He performs solo and as a chamber musician in France and abroad: in Paris, Salle Pleyel, Radio France (concert broadcast on France Musique), Hôtel de Soubise, and the National Maritime Museum, in Alsace at the International Festival “Les Musicales du Parc de Wesserling”, in Chambéry at the Rencontres Artistiques de Bel Air, in Saint-Jean-de-Luz at the Maurice Ravel International Music Academy, at Guéthary Museum, in Italy at the Theatre of Cremona and at Fazioli Hall in Milan, and in South Korea at the Geoje Art Centre and the Busan Cultural Centre, as well as in London and in Vienna in Austria. Aurèle is the co-founder and artistic director of the “Classic à Guéthary” festival, which is held in August. He has already performed alongside such artists as Eric Le Sage, Henri Demarquette, Olivier Charlier, Edgar Moreau, Adrien Boisseau, Mathilde Caldérini, among others. The Polymnie label has released a CD of Aurèle playing the works of Ravel, recorded at Fazioli Concert Hall in Sacile, Italy. The disc is distributed by the French label, Polymie, since November 2013 in France and abroad. “Far from playing this music in an affected way (the worst possible “cliché” for interpreting French music), Aurèle Marthan goes straight to the essential with emotion but with a certain restraint that confers a wealth of sublime distinction to the whole of his Ravel recital. It is admirably conceived: subtle and elegant without even the slightest hint of mushy sentimentality.” Clément Mao-Takacs. Aurèle has been supported by the Zaleski Foundation since 2013.